It’s a new week and a new line-up of events, including the scariest night of the year this Friday as we bring you Fright Night! You can find out about loads of different events, from club nights to comedy and movies to meetings, on our What’s On Calendar. This week’s music will be bought to you by our very own LiveSoc. The fantastic new menu in The Bridge will also be available, serving a range of delicious, quality food at great value. Our brand new Open Mic Night in The Bridge, from 8pm and with FREE entry. It’s open to all, and is a chance for acoustic guitarists, singers, magicians, comedians, jugglers or anything to get some stage experience. As an extra special launch night treat, we also have a pair of tickets to the Freeze Festival in London on 26th-27th October to give away to the best performer on the night! Plus Union Films are showing Safe at 7pm in the Cinema, tickets are just £3 from the Box Office! Student Therapy at Oceana, from 9pm until 3am with tickets just £2.50 from www.susu.org/boxoffice. One of the biggest student nights out in Southampton’s only superclub. Wednesday Mash-up at The Union Winchester, from 7pm with completely FREE entry. Karaoke in The Stag’s, from 9pm with FREE entry and loads of great songs to choose from. Postgrad Pub Quiz in The Bridge, from 7pm. Entry to quiz is just £1 and the winner takes the lot! The Bridge will also be serving delicious food from the brand new menu. 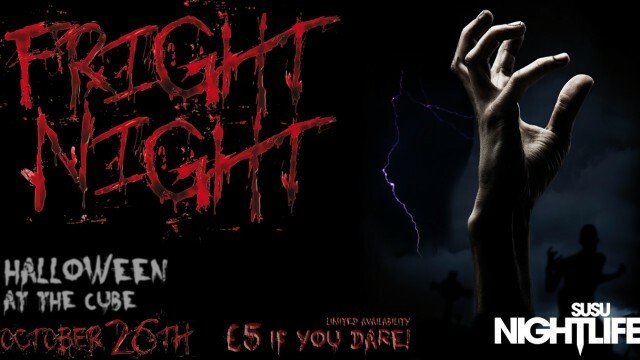 Fright Night in The Cube, with doors from 10pm. This is set to be the most terrifying night of the year and we’ve got loads of scares in store, including a freaky funfair with a ghost train, themed bars, a horrific blood storm and loads more surprises on the night. Prepare to be shocked, amazed and scared out of your skin! Keep your eyes on our Facebook page for Fright Night competitions throughout the week, including best costumes – so start getting your outfits ready. Tickets on sale now for just £5 from www.susu.org/boxoffice. Start the night early in the Platinum Bar, with exclusive Platinum entry from 9pm. Union Films present Halloween the All-Nighter, over 12 hours of scary films across 2 screens, plus a free t-shirt. Tickets are £12 from www.susu.org/boxoffice now and check out the Union Films Facebook page for hints about the Screen 1 line-up.